So the second cupcake recipe the Explorers tried was also deemed inferior and, as such, not worthy of the title "Ultimate Vanilla Cupcake". On Sunday I baked the cupcakes from recipe number 3. I am really curious to see the results of this one. Stef provides us with a thorough report at the end of each testing period, going over the results of the survey we each complete after we have baked and tested the cupcakes. She must be wondering if it is possible to have 80% of us agree on a recipe. It is a tough challenge because everyone has different tastes, ovens, mixers, etc. While we were at the family reunion in Cincinnati, the wife of one of my cousins brought along two different kinds of cupcakes. They looked like they came from a bakery! I did not try the vanilla cupcake as I believe she said she modified a box mix for that one. At any rate it wouldn't have mattered. As soon as I heard triple chocolate on the second cupcake, I made a beeline for that tray of cupcakes. Made from scratch, I can sum up these cupcakes in three words - Oh My God! They were amazing! I got her email address, and I am going to see if she will share her recipe with me. They were to die for, that's all I'm saying. This weekend was the Crusham family reunion in Cincinnati. We could not leave for the trip until 5:30 Friday night since Jim had to be in Kirksville on a project all day. Knowing that he was already doing six hours of driving that day, I drank a lot of caffeine so I could handle the night driving by myself. I had done a Map Quest to the cousin's house where we would be staying, and it indicated that going over on I-70 through Indianapolis would save thirty minutes over going the I-64 route through Louisville. We always go I-64 because it is far less traveled, particularly by trucks, and is a much prettier drive than I-70. But since it was going to be mostly night driving and we were already arriving at my cousin's house after midnight due to the hour change, we decided to try I-70. Things were going pretty smoothly until we hit the middle of Indiana. Then there was road construction after road construction. And the truck drivers decided that seven miles away from where the left lane actually closed, everyone should already be staying in the right lane. One of them would sit in the left lane and block it. So for miles ahead, no one was in the left lane. Bottom line - the decision to save thirty minutes ended up costing us an hour and a half. We arrived at 1:30 a.m. Grrrr... Needless to say, we did not come home that route, and despite stopping two times made the return trip in 6 hours and 10 minutes. We didn't need to get up early on Saturday, but I was awake at 7:00 anyway. Gene and Rita's eight year old grandson had his first football game of the season at noon, so Jim went with them to that. (Jim said it was a real hoot because there was a little cheer leading squad - eight year old girls dressed in cheer leading outfits - and parents in team booster chairs, etc.) Kathy, Skip and I headed to the park where the picnic was being held at 1:00. The weather was a little hot and humid, but the shelter had ceiling fans which helped a lot. There was a decent turnout for the reunion. Only three of the eight children in mom's family are still alive, which is why Kathy and I feel it is so important to go over when we can. I think the last reunion was three years ago, and since then the twin of the man in this picture has passed on. It was great to see everyone and catch up on what has been going on. My sister and I were just in Cincinnati in April but we only saw a handful of the relatives at that time. On Sunday my cousin Gina (first cousin once removed!) 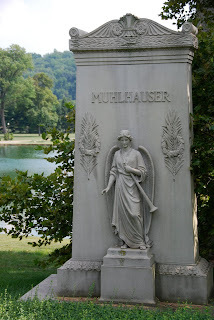 and I met up to go to Spring Grove Cemetery to take pictures. No one else wanted to go out on a hot, sunny day and join us. Imagine that! Anyway, this cemetery is like the Bellefontaine Cemetery in St. Louis in that it contains the remains of the Who's Who of the city. Spring Grove is amazing, and may outdo our cemetery for the simple fact that the topography is so interesting. It is very hilly, and I lost count of how many small lakes were in it. Even though we were hot, dehydrated and bug-bitten, we had a great time there. I definitely will need to go back as we probably didn't see a fourth of the cemetery. After that I called to see what the rest of my family was up to, since they had been going to Newport on the Levee, a really cool shopping and dining location on the Kentucky side of the river. (Take note St. Louis - you could have an amazing destination like this!) They had eaten appetizers and had drinks outside along the river, so they weren't going to be ready to eat supper until 7 or so. Gina and I had not had lunch, so we decided to go to a little hole in the wall pizzeria. Her brother Tony came and joined us. We shared some great stories and some even better pizza. Yum! Overall it was a great trip, but it was good to get home last night. The best ending to the evening came in the form of a phone call from Katie. It is the first time I have talked to her since she left for Seoul a week ago Saturday. She just called to ask quickly if I could get on skype, so we ended up finishing our conversation through the computer. God, I love technology! It was so great to be able to both see and talk to her. She is doing well, and loves Seoul. She is hoping that she will like Shanghai as much as she does her current home away from home. So far the only problem she has had is that she cannot buy an international sim card that will work in her phone (the brand new phone that the US Cellular folks assured me would work in Korea and China!) Katie does think that the problem only exists in Korea as they use a different type of card there. I hope she is right, because she will definitely need a phone for the four plus months she is in China. And I need her to have a phone while she is there. Phone home, KT! 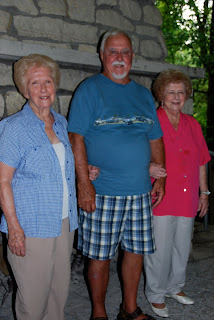 This weekend we are heading to Cincinnati with my sister and brother-in-law for a Crusham family reunion. This is my mom's side of the family, and only one brother and two sisters remain of the nine children grandma and grandpa had. Each time I go to a reunion it seems that there is one less person in the group pictures. And I always wonder what will happen to the reunions when the last three siblings pass on. It doesn't seem like our generation is all that interested in large family gatherings. My sister and I make the trek from St. Louis every time a reunion is held, but cousins who live there in town can't be bothered to stop in even for a brief period. Speaking of pictures, one of the many boxes I inherited when my dad died contains old family photos. I am in the process of scanning them so that I can share them with my siblings and other interested relatives. I first divided the photos up by family and created a bag for each of my three siblings. 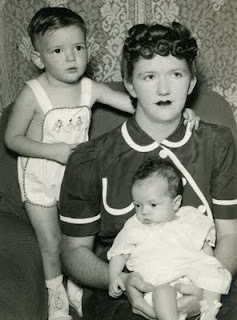 They mostly contain photos of their own families that they shared with mom and dad throughout the years. That was the easy part. The stack of photos I knew we all might be interested in I decided to make digital rather than making prints the others might not even care to have around. Scanning is a slow and tedious process, particularly since I feel the need to clean most of the photos up with a photo editing program. I am not quite sure what to do with the scanned pictures when I am done. There will be too many to email to my siblings, plus I want the photos somewhere that my cousins can access them if they want. 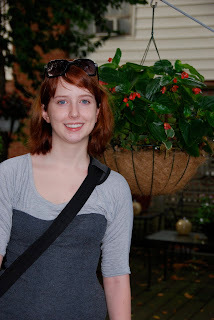 My Picassa account, where I post photos from the Missouri Botanical Garden and other public venues, has nearly 200 photos in it. Once you hit 200 photos, you have to pay an annual fee. I have a Shutterfly account where I import photos that I want to reprint or put into photo books, but I'm not sure if others can access the account or if they have to join Shutterfly just to look at my photos. I also don't know if any of my photos could then be downloaded by my relatives. It sounds like I have some research to do, which will take more time. But as I said, it's all relative. Yesterday morning we took Katie to the airport for her flight to Seoul via Los Angeles. She managed to squeeze everything she needs for 5 months into one large suitcase, one small carry-on bag and a camera case. Unbelievable! I took nearly that much on our cruise earlier this year. As we have done with her and her brother on the first day of school since they started kindergarten, we took a photo on our back porch. (Obviously when the kids went to college we had to take the photo on the day they left for the school year.) It is hard to believe that this is the last one we will take since she is now a senior. I got one ticked off text message from her in LA because Asian Air had given away the window seat she reserved months ago. Apparently they go by when you check in, and people began checking in at 5:30 a.m. for a 1:40 p.m. flight. What the heck? What is their point in even assigning seats ahead of time then? They may as well operate like Southwest - at least you know what you are getting there. Anyway, she was put in an aisle seat, which she doesn't like due to the carts knocking you in the arm every time they come up and down the aisle. Of course, they do that a lot less than they used to since they barely serve you any more. I would still take that over a middle seat any day.She had a small little girl next to her, and she said while she wasn't bad she did kick the seat ahead of her most of the trip (12 hours and 30 minutes). And the mom said nothing...I got an email from her this morning letting me know that she arrived in Seoul safely. She will be staying at a friend's house there for 3 weeks prior to heading to Shanghai. She said the only wifi is in Ji's little sisters room, so I don't know how often I'll hear from her. She is buying an international sim card for her phone though, so I'm hopeful she'll be able to call me. The time difference will be a challenge, but we can work around it. As a follow-up on the cupcake challenge, only 38% of the cupcake Explorers thought that recipe number 2 was the Ultimate, so it is on to recipe number 3. Whenever Stef figures out what that recipe is going to be. Onward, Wolter the Explorer! Last weekend we attended the Wolterman Family Reunion at Lake Okoboji in Iowa. As I was already up in Iowa to be of assistance as my mother-in-law had surgery on her carotid artery, Jim drove up separately for the gala. We were excited about this year's reunion because first of all it was being held at a lake, so swimming and boating were involved. But secondly, one of Jim's cousins had sent out an email earlier indicating that she was no longer interested in keeping a dresser that had been Jim's great-grandparents. The email told the story (and included pictures!) 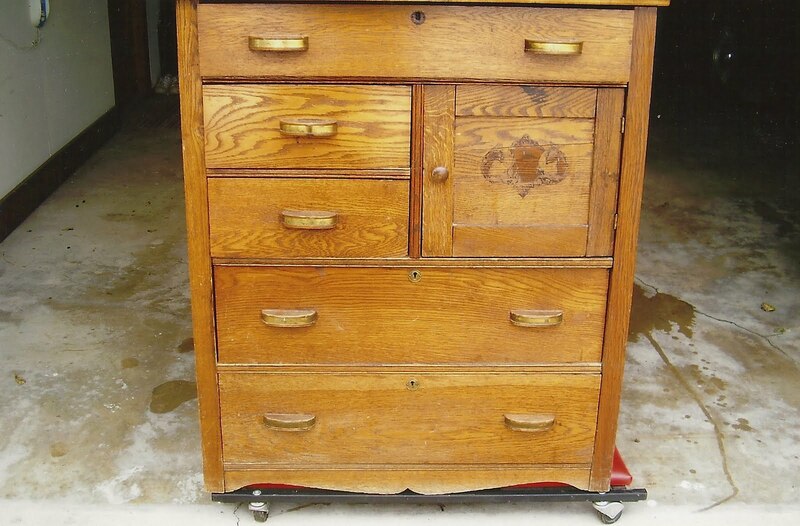 of the dresser, and how it had been passed from generation to generation, often serving as a baby changing table - before they came up with all the fancy changing tables on the market today. If you had an interest in the dresser, you simply had to let Kay know and she would bring the piece from her home in northern Illinois to the family reunion. If multiple people wanted the dresser, then all the names would be placed in a hat and a winner would be drawn. 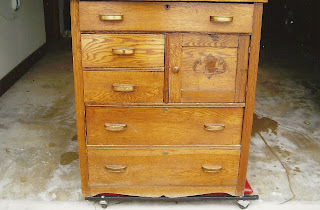 The caveat was that you had to be able to take the dresser home with you. No delivery would be available. Anyone who knows Jim and me, especially if they had seen our house and all the antiques, would know that we put our name in the hat. Besides the fact that this is an antique, we would have wanted it due to the provenance of the piece. Interestingly, Jim's dad was the first one to say he wanted it. Jim and I discussed this, and we decided that if our name was selected, we would give it to his dad. In my opinion, the piece should have been offered to the remaining siblings first. Jim's folks were unable to attend the reunion, located two and a half hours from their home, due to Lorraine's surgery the previous week. As it turns out, that would make Jim and me the only Woltermans at the Wolterman reunion. Funny... None of our names were selected for the dresser, which went to a first cousin of Jim's up in Minnesota. We were disappointed, but we had a great time at the reunion that day. There was great conversation, good food, boating and swimming. The lodge in the state park was huge, with screened in windows, ceiling fans and loads of tables and chairs. In the evening we headed to a cousins lake home, and didn't get back to our hotel room in nearby Spencer until nearly midnight. The next morning the cousin with the lake house hosted breakfast, and Jim took off on a jet ski with another cousin. Had I not showered and done my hair and make-up that morning, I would have gone along. I love to jet ski! When we arrived back at the lodge for lunch before heading home, we were told that the sisters (Jim's aunts) had decided that we should take the dresser because the person whose name was drawn was not even at the reunion, and her mom didn't have a car big enough to take it home nor was she at the lodge that day to make arrangements for the piece. So we loaded it up and took it back to Charles City with us. There may be some hard feelings from the one family member, but for now the piece is in my father-in-law's garage where he is anxious for the weather to cool so that he can restore it. It was meant to be! Today I baked cupcakes following the second recipe of the Cupcake Project as Stef searches for the Ultimate Vanilla Cupcake. I learned some new tips from this recipe, and that was exciting for me. Katie helped in the kitchen by cleaning up the dishes as I dirtied them. It has been quite a while since we have been in the kitchen together, and it was great to have the time together. She leaves in 11 days for South Korea and China, and she'll be gone for four months so today's activities together were especially precious to me. The three of us had cupcakes, without frosting per Cupcake Project's instructions, for dessert tonight. But you will have to wait until the end of the weekend to hear what we thought about them. This is too fun!